Bitcoin has certainly been on a roller coaster ride over the past several months, with several people questioning “Bitcoin? Is it good? Should I buy it? The price keeps going up like magic and never crashes, at least for long anyway. Buy the dip, and HODL!”. Where Bitcoin bulls say it’s on track to hit $100,000 in 2018, I kind of look at the whole thing as if it’s teetering on the brink of disaster. Bitcoin’s maximalists claim it will save us from the tyranny of the printing press of central banks. But what if, in some gesture of supreme irony, Bitcoin’s undoing was actually the very same problem it set out to solve: namely the fiat currency “printing press”, except this time it was being used to prop up the Bitcoin bubble from its inevitable collapse? I, and many others, suspect Tether is being used to effectively counterfeit hundreds of millions of dollars of perceived value, which are being immediately reinvested into Bitcoin to keep it from collapsing. But to explain this, let’s first start at the beginning: what is Tether? Okay, great, so at least according to Tether every one of their tokens, or “USDT”, is allegedly backed by actual US dollars sitting in “reserves” somewhere, or so the story goes. Can we trust someone else besides Tether to back up that claim? Tether says yes, so surely we can trust Tether that someone is keeping tabs on Tether’s “reserves”, right? Frequent professional audits! Well as long as those are actually happening, surely everything will work out okay. If anything is amiss, the auditor will certainly alert us to problems, because Tether says they will. Great! So why might we actually want to use Tether? 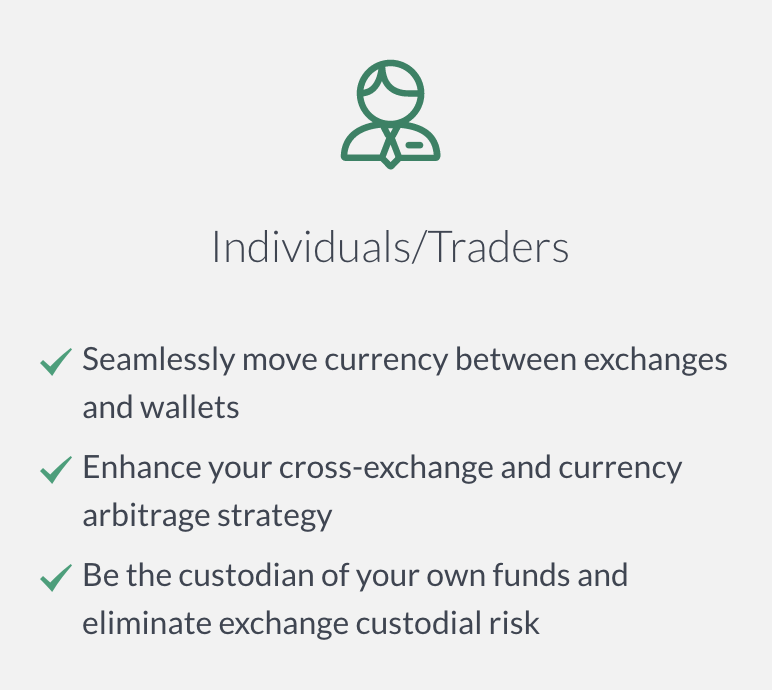 Now you can use a centralized fiat cryptocurrency to “Be the custodian of your own funds and eliminate exchange custodial risk”. Instead of FDIC insured funds backed by the United States government (but subject to those pesky AML/KYC laws), you can instead use… a cryptocurrency run by people who totally swear every $1 USDT of funny money has a corresponding $1 USD of real money sitting in “reserves” somewhere, and auditors are totally keeping tabs on things. Allegedly! 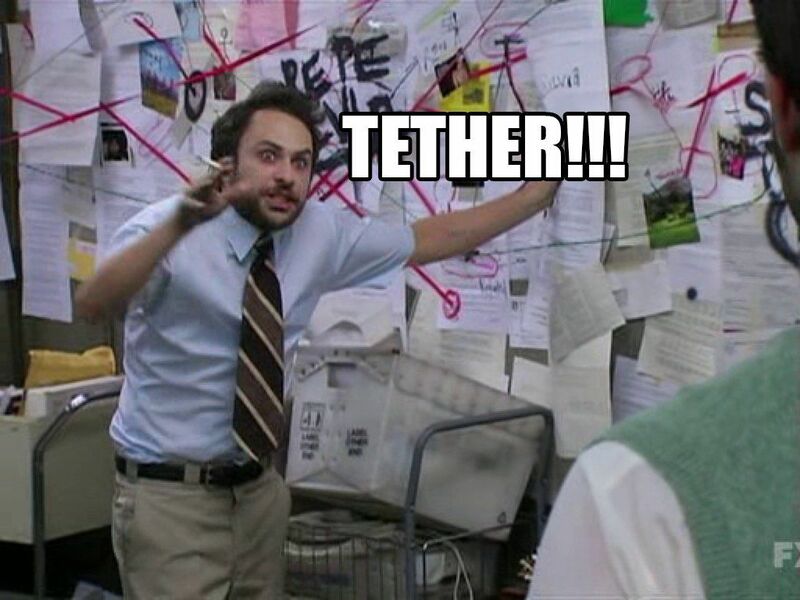 According to Tether! Well, the Tether audits tell a different story (you can read the redacted report directly here), and despite claims they’re being audited regularly I can find only one (heavily disputed) audit report, but I digress. 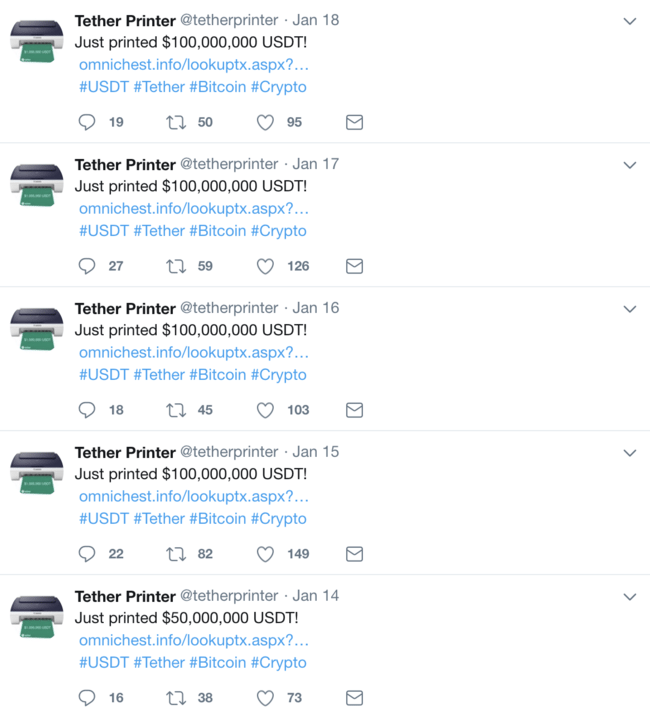 They also got hacked a few months ago and allegedly lost $30 million worth of USDT but that is chump change compared to the massive volumes of Tethers they have printed in the past few days. So this whole thing sounds super shady. Why would anyone take it seriously in the first place? How can we actually tie its value to fiat currency and ensure the price remains stable? There are a lot of ways you could possibly accomplish this. Some of them potentially have merit. Hayek had thoughts on how this could be done right. However, if you’re new to Tether and looking to give it the benefit of the doubt, let me take you through Tether from its inception and then compare it to how it exists today. Let’s say Tether has actually built something which is truly intended to hold its value at least as well as the US dollar (please hold your guffaws regarding USD’s sinking value and please direct your energies towards America’s Shithole President). There are a lot of good ways we could do this, and then there’s the way Tether originally did it, which is not how Tether works today. So how did Tether originally work? Initially, you could use a Legacy Bank technology called a “wire” which provides a faster-than-ACH bank-to-bank transfer mechanism. 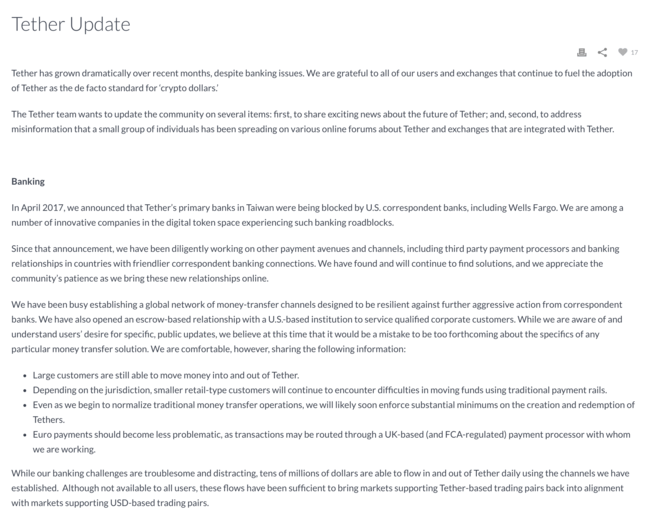 You could buy Tethers and take advantage of their remarkable ability to “bypass financial institutions” and their pesky AML/KYC regulations by buying “USDT” funny money with cold hard cash. 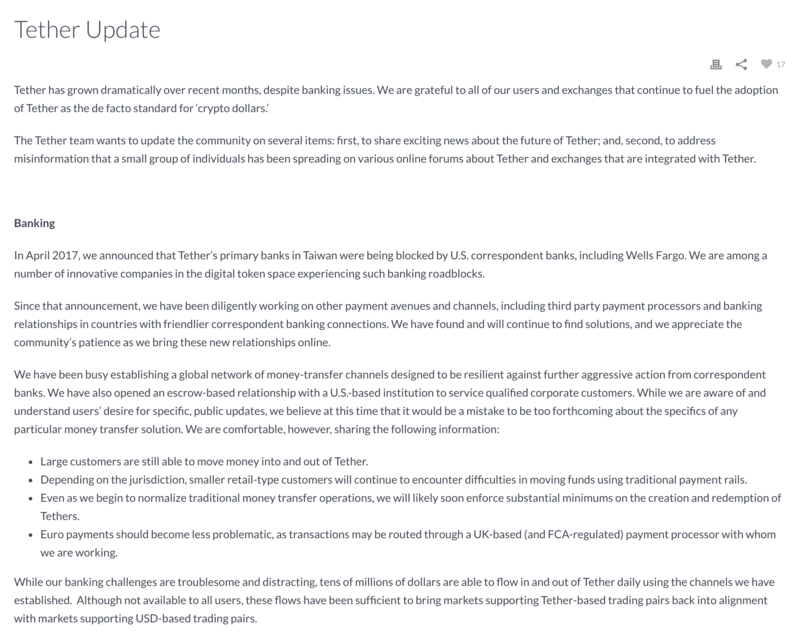 Originally Tether would also send outbound wires too, so if you held USDT you could, in theory, cash it out as actual USD at any time. By bridging the gap between legacy systems and fancy new cryptocurrencies, you can have the best of both worlds: a self-sovereign crypto-asset whose value is “tethered” to the value of the dollar, redeemable at any time for the equivalent in cold hard cash. Awesome! 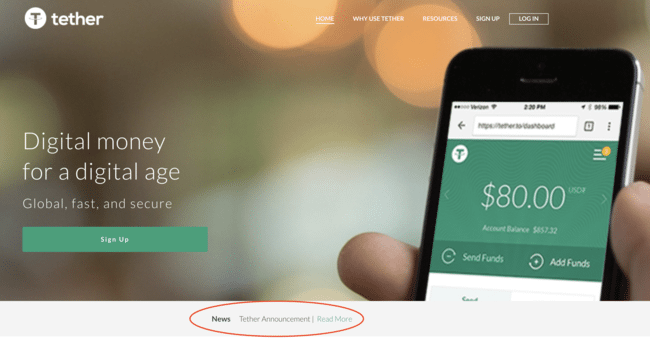 Tether is setting our USD free of the evil legacy financial system. A few days ago CNBC noted that in an almost universal downturn across cryptocurrency, Tether was the only thing that was holding value. Great! 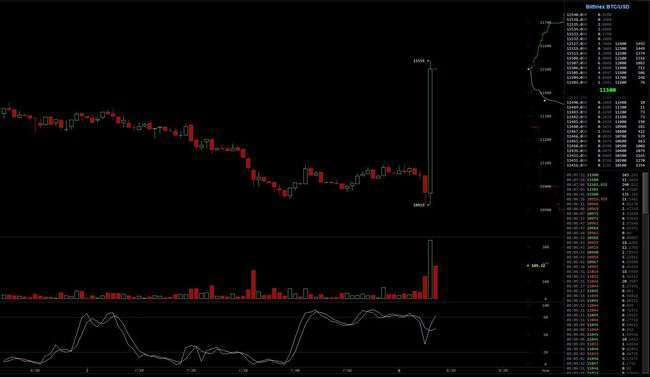 Pump $USDT, surely it is the future of cryptocurrency. That’s a lot of words. What’s the tl;dr? As of approximately April 2017, you could not buy or sell USDT for USD. It’s as if it became… un-Tethered. Whatever legitimate uses of Tether as some sort of cryptocurrency proxy for USD ceased to exist in any form that day, and Tether became “a cryptocurrency we believe holds a dollar value because Tether claims they have the dollars in their bank account”. 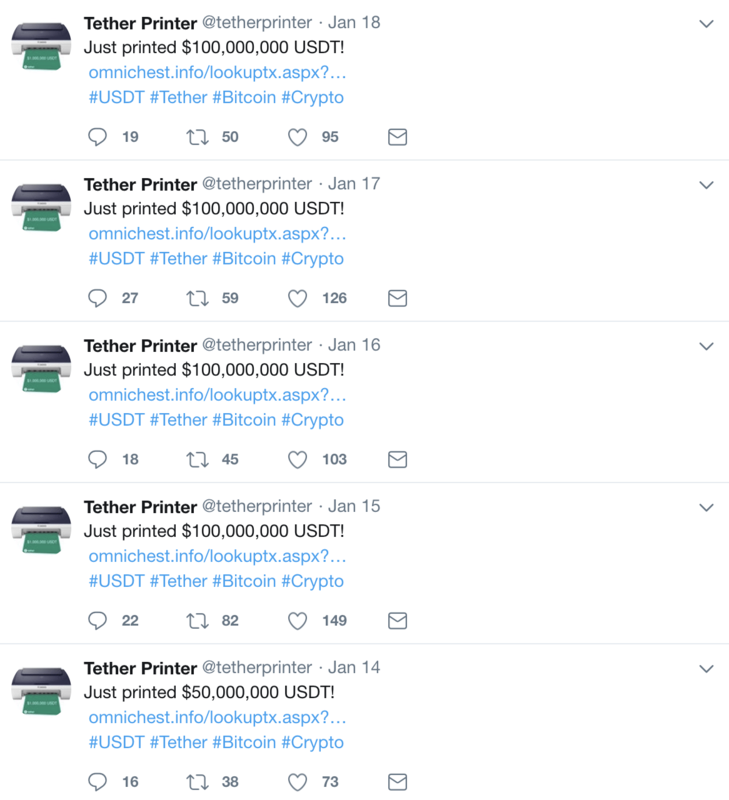 At the time this announcement was originally made, Tether’s market cap was approximately $50 million. Its current market cap is $1.7 billion. Okay, so perhaps Tether is a scamcoin used to deceive users into cashing out into it instead of real money. Still, things could be worse, right? 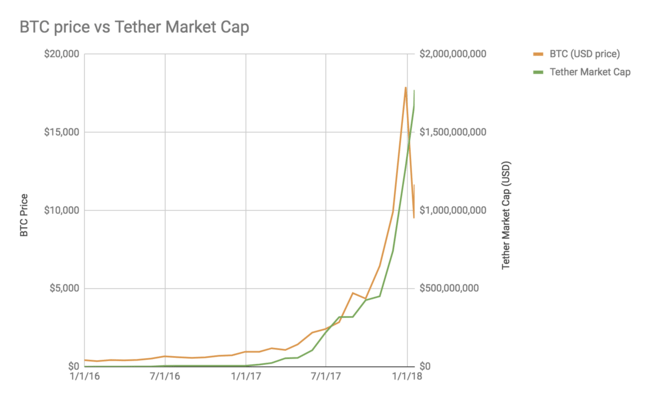 As of January 19th, 2018, Tether’s daily volume is $3.9 billion USD. That’s right, Tethers are moving nearly $4 billion worth of value each day. 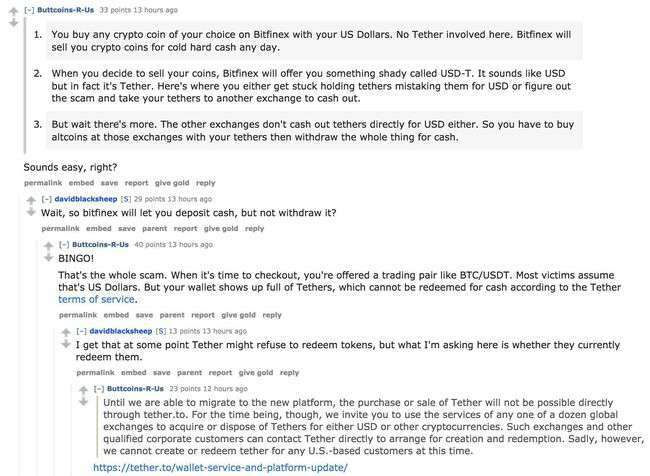 These are allegedly mostly inter-exchange transfers between cryptocurrency exchanges, which if you buy Tether’s own marketing material are deliberately intended to skirt AML/KYC laws. But have we hit rock bottom yet? Oh my, no. True to at least some of their words, Tether does provide transparency into their USDT issuances. But if we actually scrutinize them, we find a sort of transparency which is no better than Donald Trump Jr tweeting incriminating emails. Sure, it’s great if they publicize their suspicious behaviors for all to see, but that should not squelch your alarm bells! That’s $450 million dollars in a little less than a week, highly correlated to a “Bitcoin bloodbath” where the cryptocurrency lost nearly 50% of its value since December. 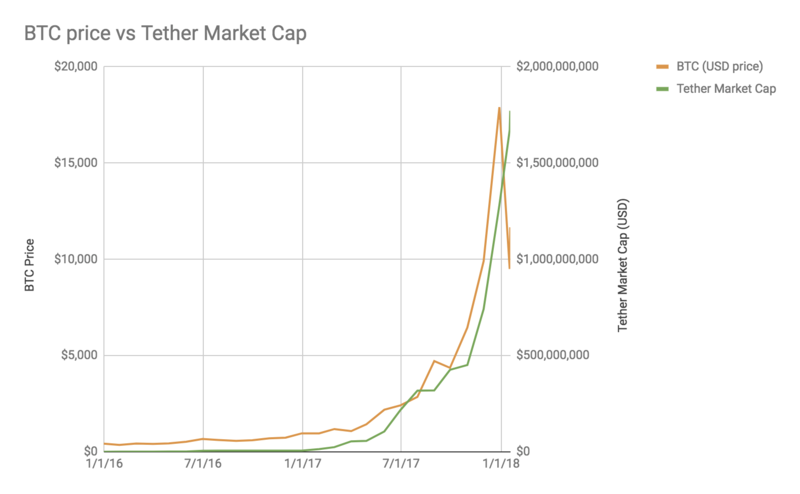 $450 million is a roughly a 40% increase in Tether’s previous $1.2 billion market cap, bringing the total to approximately $1.7 billion USD worth of “USDT”. Now let’s keep in mind that Tether insists that they have this much in equivalent USD value their “reserves”, and that they are “subject to frequent professional audits”. But is any of that actually true? I can’t tell you, but if it is I’m curious where they got nearly half a billion dollars in cash this week and would be very interested in the results of a new Tether audit. I can’t tell you why the price went down… some people apparently suspect the Moon is the culprit, but in examining how the price got back up from sub-$10,000 levels to, as of the current time of writing, the $11,000 range, a point it has somewhat curiously fluctuated around, with just enough headroom to make you think >$10,000 Bitcoins are here to stay. In the middle of a massive selloff, suddenly out of nowhere we see buys for $500 above market value. And this isn’t just an isolated incident, but part of an ongoing pattern where a downward trend in Bitcoin’s price mysteriously reverses shortly after new Tether issuances. I can’t prove this sort of buying pattern is directly related to Tether issuances. I have no idea who is making these buys. But I can say this absolutely reeks of price manipulation, with timing highly correlated to Tether issuances. I have “cried wolf” about Bitcoin crashes several times in the past, and been wrong. Perhaps I don’t know what I’m talking about. Or perhaps the price was being manipulated. I have no concrete evidence of anything I am saying beyond what is easily reachable via my web browser. This is all speculation. Conjecture. I could be wrong… I could be right. I still think the cryptocurrency ecosystem has tremendous potential value for society, but I look at what’s happening and see a cesspool of corruption worse than anything Bitcoin hoped to replace. Bitcoin’s attempts to “drain the swamp” seem to be working out about as well as Trump’s. I dream of a cryptocurrency ecosystem that’s truly a moral good and delivers real value to humanity. Instead I feel we have something where “Ponzi scheme” wasn’t to far off: it appears we may have found Bitcoin’s Ponzi and its name is… Tether (or perhaps Bitfinex). To anyone at any sort of regulatory body who happens to be reading this: I implore you: this space needs much more regulation. I think it is ripe for collapse and a lot of people are going to lose a lot of money, which from the sound of things is often times borrowed. Long after the “crypto-rush”, people are going to be paying credit card bills for digital assets which are now worthless. Fortunately it looks like some regulatory bodies are making moves in the right direction. To any reporters: please look into this! There is a very bad smell here, but no smoking gun… yet. There are questions that demand answers though: who is executing those Bitcoin buys, and what is their relationship to Tether? And finally the billion dollar question: per Tether’s own claims, their reserves should now number $1.7 billion in USD, sitting in a bank account or some other form of generally recognized liquid currency. Do they? In either case, I would love to hear from either reporters or regulators on this matter. If this whole thing leaves you wondering if you should sell your Bitcoins, well I would need to consult my non-existent crystal ball. That said, don’t take this as investment advice, but I don’t expect this will end well. However, there is one bit of precedent for a massive Bitcoin price increase followed by a massive crash: the original 2013 Bitcoin bubble and subsequent collapse which occurred as a result of the collapse of the Mt. Gox exchange. But where Mt. Gox was billed at the time as a “$460 million disaster”, well, that’s worth just about as much as the Tethers printed in the last few days. Is this a multibillion dollar cryptocurrency exchange disaster in the making? NOTE: This blog post series continues with The Tether Conundrum Part 2: The Plot Thickens.